After water, tea is the world’s most consumed beverage. More than three billion cups are drunk each year in countries across the globe – the equivalent of around 450 cups per person in a year. As a beverage, tea is unique in that it is an everyday part of life for the whole gamut of global cultures. With representation in more than 150 countries, Lipton is the world’s leading tea brand. Each year, people across the globe consume more than 100 billion cups of the company’s tea. Lipton’s second-largest plant is located in Dubai, a strategically advantageous location between tea cultivation areas in Asia and tea consumer markets. 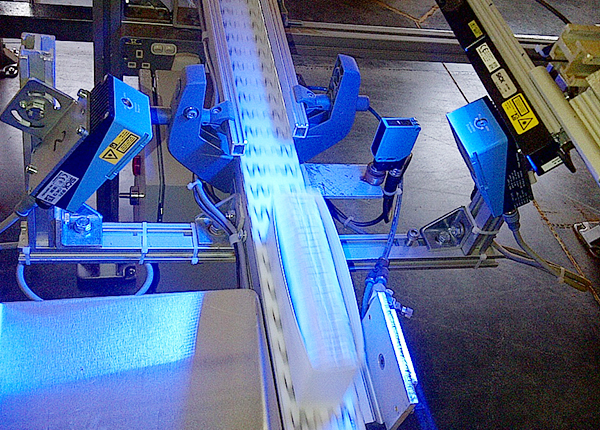 Here, Unilever deploys Inspector I40 2D vision sensors during the packaging process as a means of checking whether labels are present on tea bags, and what position they are in. Tea bags have an ingenious design with pores that let hot water in and flavor out. The strings and labels attached to some of them make it easier to remove the tea bag from the hot beverage or the cup. Printing information about the company and the bag’s contents on the labels also provides an advertising platform. In cases where tea bags are placed in one or more rows in boxes without any other packaging, Unilever attaches great importance to checking that the labels are positioned directly next to their associated bags – and not anywhere else – before the lid is closed. Each thread, with label attached, should be wound around its bag; otherwise, there is the risk of threads becoming tangled and torn away from the bags when the boxes are closed and move to the next stages in the packaging line. Once filled, most boxes of tea are wrapped in a transparent film with a pull strip that allows it to be removed – but if a bag label is in the way, this process also has the potential to go wrong. In addition to being aware of production risks, household-name brands know that presenting their products perfectly is a must. Equipped with a wide-angle lens for a large field of view in close-range installations, and a blue color filter to ensure higher contrast, the Inspector I40 is able to differentiate reliably between the reference image of a perfectly filled box of tea bags and images showing labels out of place. This intelligent solution removes the need for an additional PC to evaluate images. 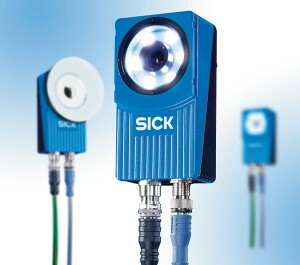 The sensor is connected directly to the control or a pusher via its digital outputs. 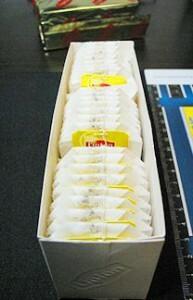 In the Lipton plant in Dubai, two Inspector I40 devices are responsible for inspecting the boxes of tea bags, with one working at each of the boxes’ long sides. The simple configuration in SOPAS, including an emulator for offline configuration, makes it easier to transfer settings between one device and the other. The Inspector I40 combines a high-resolution image sensor with an additional speed boost, improving image quality. Its powerful testing toolkit provides straightforward solutions that are easy to configure. One of the most efficient object identification algorithms is able to track the part or detail that is to be inspected, regardless of its position, rotation, or size in the image field. This enables reliable inspections without the need to know the exact location of the object, thus accommodating any deviations in the product position’s repeatability. The Inspector vision sensor for image processing applications represents an intelligent solution in a single device, and can be relied upon whatever the task: quality and completeness verification, part position detection, or measuring applications. The rugged IP67 metal housing is adapted for industrial use and, thanks to its intelligent image processing, the Inspector is perfect for applications involving high speeds. The Inspector I-series versions are built to stand up to the challenges that demanding inspection tasks present, with an integrated toolkit that verifies quality and completeness. The Inspector sensors deliver reliable performance even in changing ambient light conditions, and slight distance variations do not affect them. Its flexible, interchangeable lens makes it easy to optimize image quality. And with front screens that can be swapped out, the I-series represents the perfect single-component solution for a whole host of applications.